JR WPH proudly completed 2017 with more than 1,000 exciting junior handball clinics and tournaments in New York, Florida, Idaho, California, Louisiana, Texas, Arizona, Utah, Oregon, Nevada, Pennsylvania, Canada and Mexico, with junior handball players receiving instruction from the world’s best handball coaches and players. Alongside clinics and tournaments, JR WPH also proudly sponsors junior handball teams and programs across the country, providing youngsters with opportunities to play handball on organized and structured junior handball teams led by certified WPH instructors. The mission of JR WPH is to inspire the next generation to develop discipline, sportsmanship, teamwork, integrity, and a physically active lifestyle through handball. Since JR WPH’s inception in 2013, JR WPH has provided opportunities for more than 7,000 youngsters to experience the challenge and thrill of learning and playing handball in structured, organized, safe, and supportive clinics and tournaments that emphasize camaraderie, having fun, and developing life skills and a lifelong commitment to physical fitness through handball. JR WPH initiatives are supported by donors that are determined to grow the game and to provide opportunities for youth development through handball. If you are interested in becoming a JR WPH donor, you can donate on-line here, or send your generous gifts through PayPal (extremehandball@cs.com) or by mailing checks to: WPH, 3561 E. Sunrise Dr. Suite 125, Tucson, AZ, 85718. All donations will be used to fund future junior handball initiatives. Check out all of JR WPH’s sponsored clinics and programs 2017 below. JR WPH Westside YMCA 2017 Clinic (January): JR WPH was proud to sponsor the Harry Mellis Westside YMCA junior handball program for the second consecutive year. 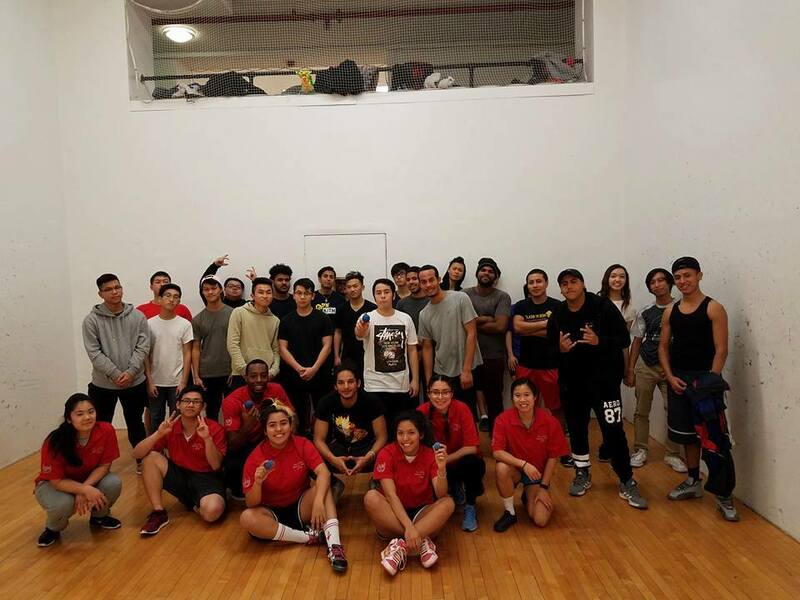 Led by WPH Certified Coach and Women’s Race 4 Eight and WPH Outdoor superstar Danielle Daskalakis, the JR WPH Harry Mellis Westside YMCA program provides opportunities for hundreds of New York City youth to play 1-Wall, 3-Wall, and 4-Wall handball each year. 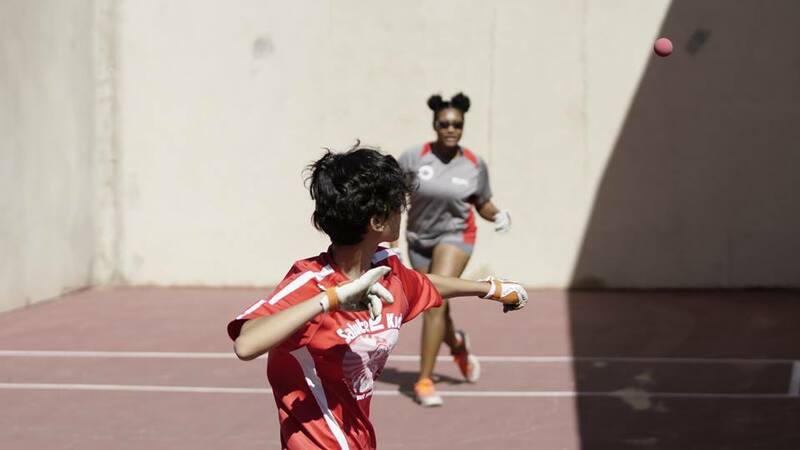 H does and we are so happy to bring our kids to such a great event to watch the pros, learn, play and just be a part of it,” stated Hope in Handball’s founder and director David Botero. 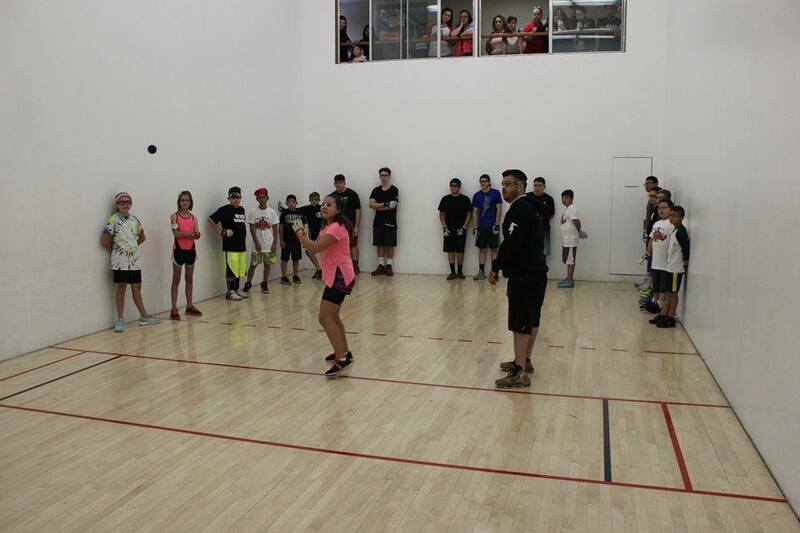 (July): JR WPH is thrilled to sponsor the JR WPH Juarez Summer Handball Camp for the second consecutive summer at the Campestre Country Club in Juarez, Mexico, coached by 2016 JR WPH of the Year Richie “Drft” Fernandez. More than 100 youngsters between the ages of 3-14 are participating in the camp, with the 2016 JR WPH Coach of the Year teaching handball rules, fundamentals, strategies and games in organized and fun camp sessions. 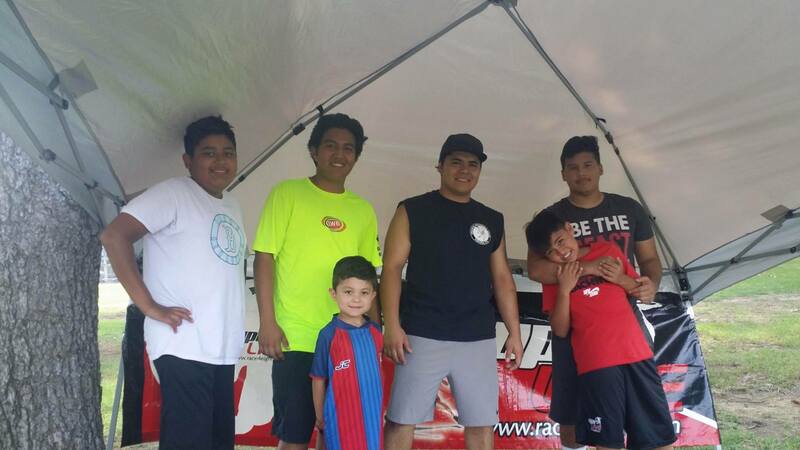 Last year’s Juarez summer handball camp ended with a camp tournament, with the new handball enthusiasts playing for WPH prizes and gear. Expect the same at the end of this summer’s camp! JR WPH Pittsburgh Summer ’17 (summer): Pittsburgh’s Amerifit Handball Club has hosted numerous JR WPH junior handball clinics in the summer of 2017, with WPH Certified Coaches leading high-energy clinics for youngsters from Pittsburgh and eastern Pennsylvania. 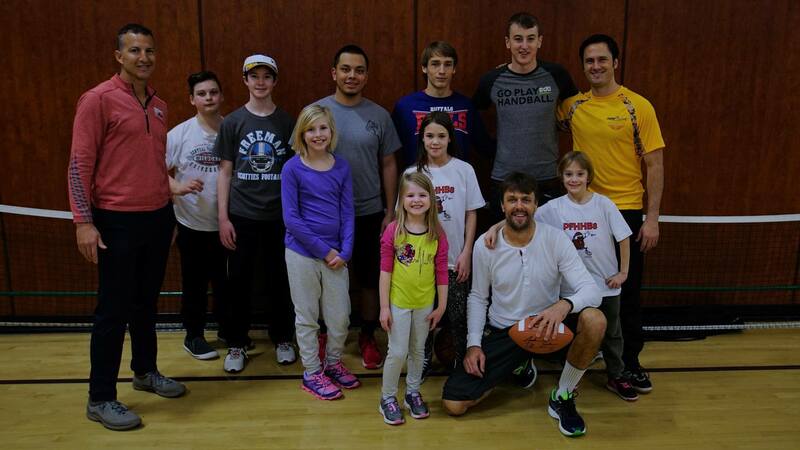 July’s Pittsburgh JR WPH clinics kicked off with Harisburg’s Hope in Handball team at the RFC 9 and continued with clinics for high school and collegiate athletes at the home of the RFC. 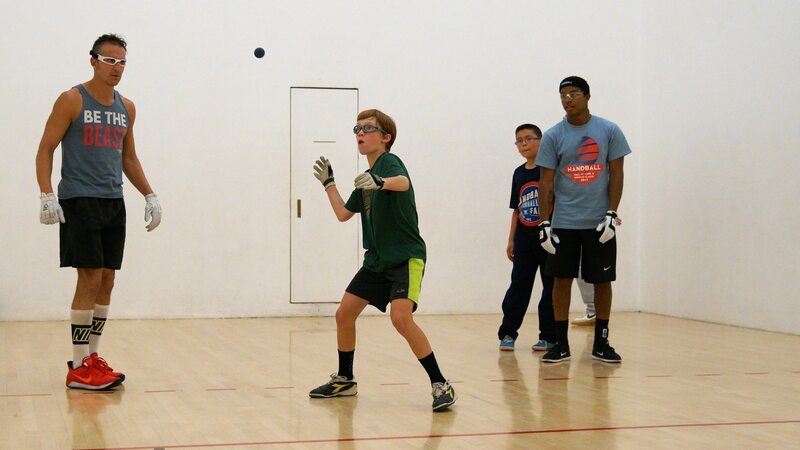 Pittsburgh’s Amerifit Handball Club is proud to host year-round junior clinics, gathering dozens of young people each year into the WPH RFC’s home courts. t jog, followed by Big Ball instruction for the youngsters, demonstrating the proper footwork to hit kill shots. Race 4 Eight pros Shorty Ruiz and Abraham Montijo coached the second half of the clinic, focusing 3-5 shots rallies and Small Ball stroke technique and strategy. The clinic concluded with a discussion on the importance of eye protection and good sportsmanship. 105 Junior Players @ the JR WPH NYC Shootout! 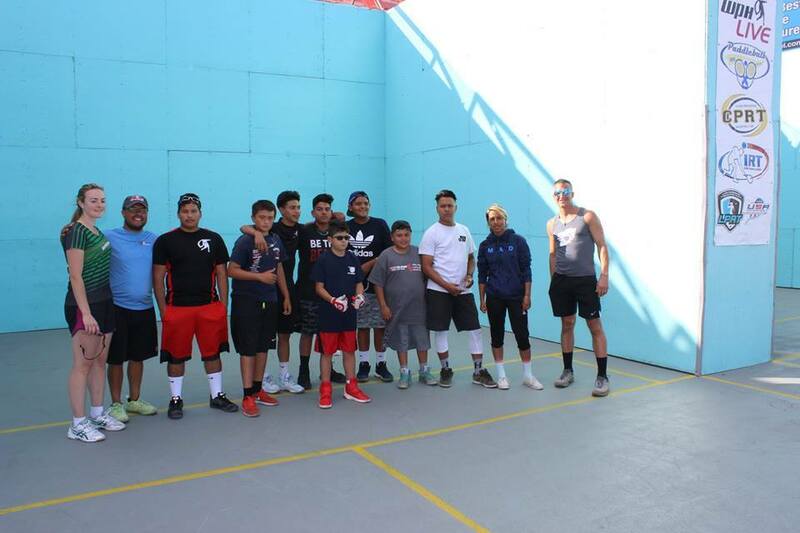 (July): JR WPH and the Lincoln Terrace Handball Association proudly presented the JR WPH NYC 1WallBall Shootout for the second consecutive summer at Brooklyn’s St. John’s Park. 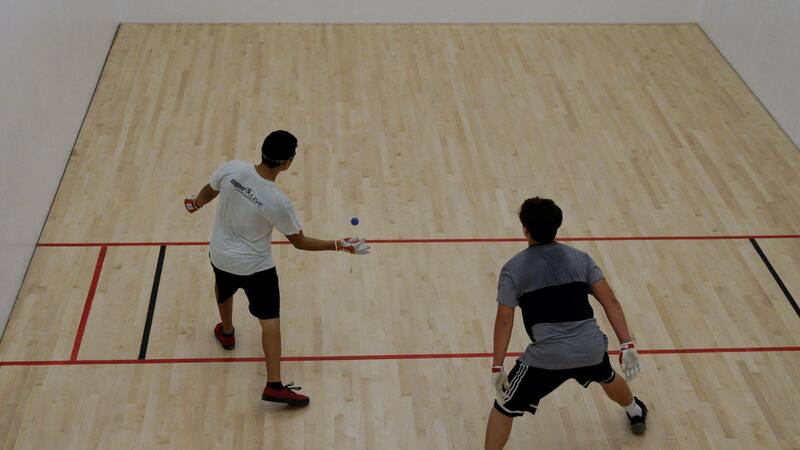 105 junior handball players between the ages of 12-19 filled St. Johns’ spectacular 1-Wall courts, making the JR WPH NYC 1WallBall Shootout one of the largest junior handball tournaments of the year. WPH ambassador Veronica Figueroa directed the event, recruited players and ran a sensational event. JR WPH in Fresno (August): JR WPH proudly hosted a JR WPH outdoor instructional at Fresno’s Hotter Than Hell 3-Wall event on the first weekend in August, with WPH Outdoor pro and WPH Certified Coach Sal Duenas educating the youngsters on the importance of hydration, stretching and point-play strategy. Along with the hydration education, Coach Duenas introduced various stretching and warm-up exercises to prepare the junior players for playing a handball match. Coach Duenas then observed and coached the junior players during point-play situations. Thank you very much to Coach Duenas for teaching important lessons to the next generation of handball stars. the coming months, Coach Levy plans to visit the University of South Alabama, University of Louisiana in Lafayette, and LSU to coach handball clinics for college students. Wow! Thank you to Coach Levy for his inspiring and sensational efforts to grow the game throughout the Southeast! 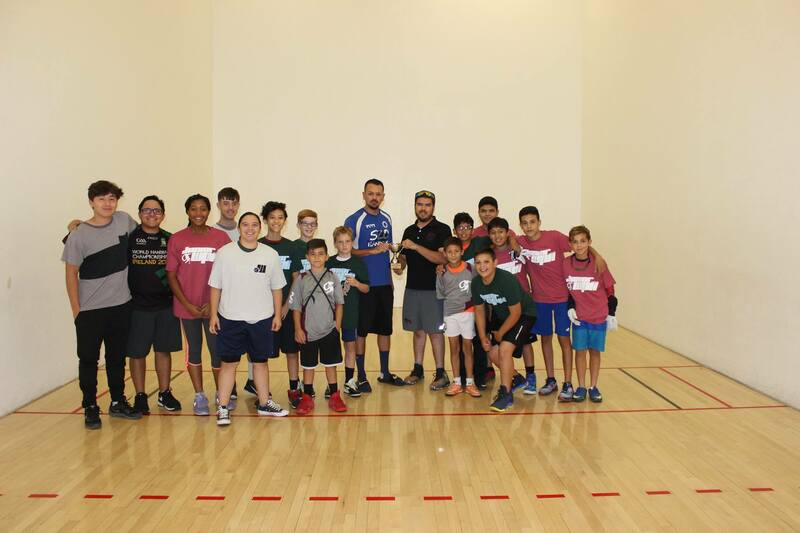 Coach Peixoto Leads the OC JR WPH Summer Camp (August): The Second Annual Handball Junior Camp at the Olympic Club was a major success! 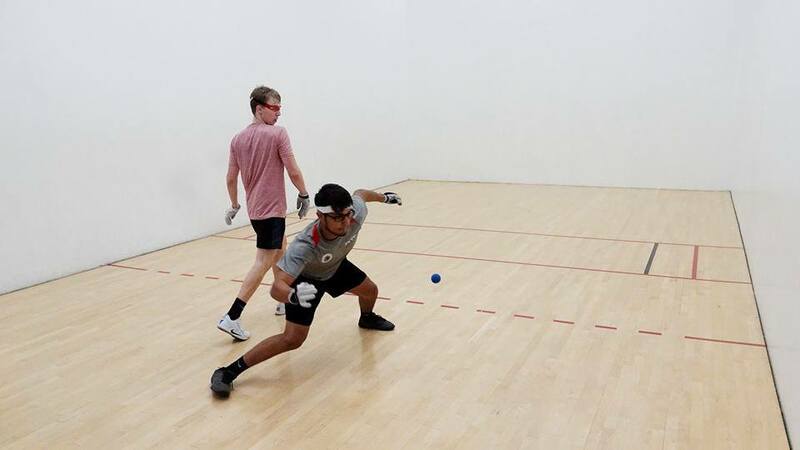 At this four-day intensive junior camp, Olympic Club Handball Coach and WPH Master Instructor, Emmett Peixoto, coached seventeen junior campers of all levels of play. The camp included focused instruction on the sidearm, overhand, and underhand swings, drills for foot-speed, back-wall, and kill shots, and guidance on basic handball strategy. Each day began with stretches and the David Chapman Warm-up Routine and culminated in a mini handball tournament, in which all of the kids played in front of each other and cheered on their fellow campers. 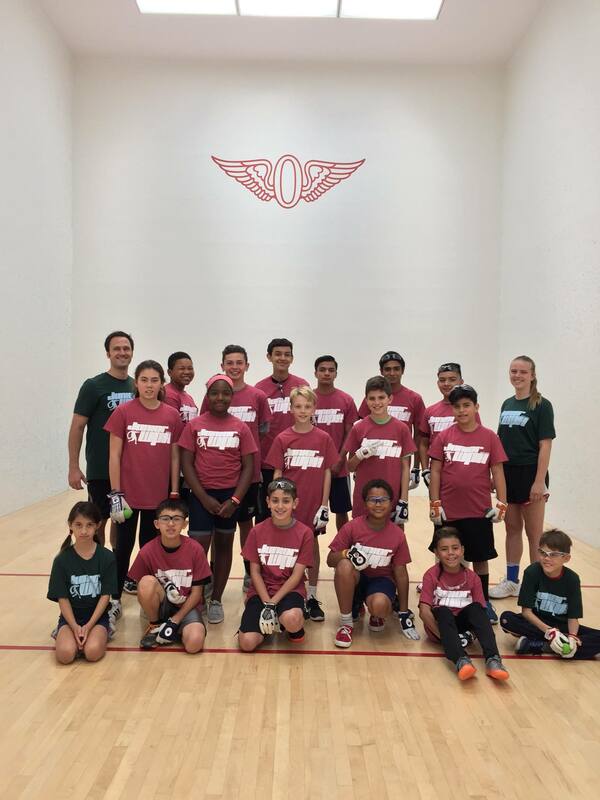 JR WPH Harry Mellis Updates (August): The JR WPH sponsored Harry Mellis New York City junior handball program continues to flourish under the direction of WPH superstar coach and player Danielle Daskalakis. Coach Daskalakis, one of the world’s premiere 1-Wall, 3-Wall, and 4-Wall Small Ball and Big Ball cross over stars leads an enthusiastic group of junior handball players weekly throughout the each fall, winter, and spring at the Westside YMCA in Brooklyn, New York, teaching handball fundamentals and strategies, but most importantly, life lessons and values through handball to prepare the young adults to become mature, healthy, physically active, and disciplined community leaders. Coach Daskalakis also travels the world to conduct junior handball clinics, most recently visiting the thriving junior handball community in St. John’s, Newfoundland, Canada to work with several of Canada’s top junior players, as well as a number of less experienced junior players. Thank you to Coach Daskalakis for making a huge difference in Brooklyn and beyond and inspiring so many junior handball players. 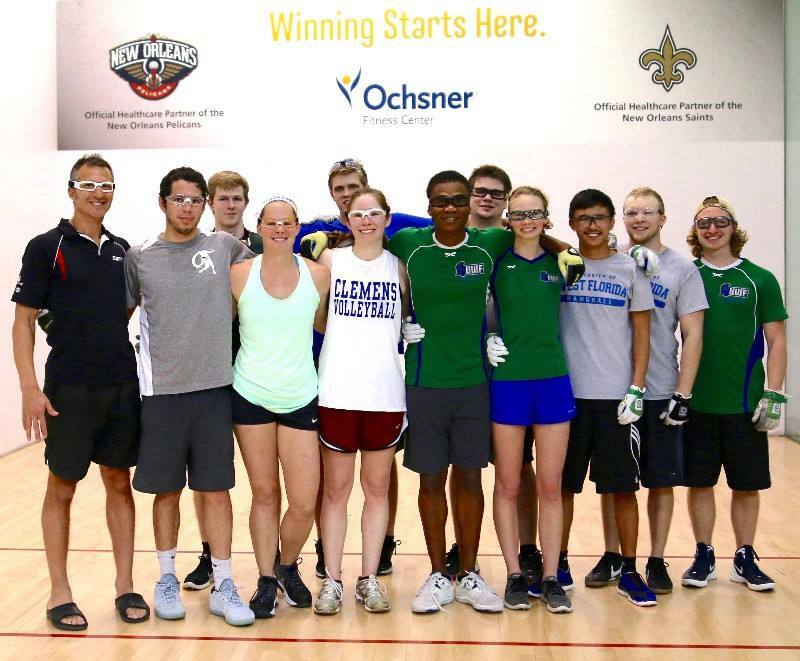 JR WPH UWF Summer ’17 Updates (August): JR WPH sponsored University of West Florida continues to flourish under the direction of UWF Handball Club founder and current UWF Outdoor Recreation Director Michael Morgan. 2016 JR WPH Collegiate Coach of the Year Mike Morgan led summer clinics for West Florida youth, as well as weekly clinics and tournaments during the school year for University of West Florida collegiate athletes and handball team members. th handball clinics for 200 local kids, emphasizing the fundamentals and rules of handball, with the emphasis on having fun on the court. Following a sensational summer of junior handball coaching, Coach Morgan and the UWF Handball Club kicked off freshman orientation at the beginning of the fall semester at UWF, introducing 400 incoming freshman to handball during UWF’s freshman orientation. The collegiate newbies were taught the basics of handball, starting with the proper swing mechanics to develop the correct handball stroke. 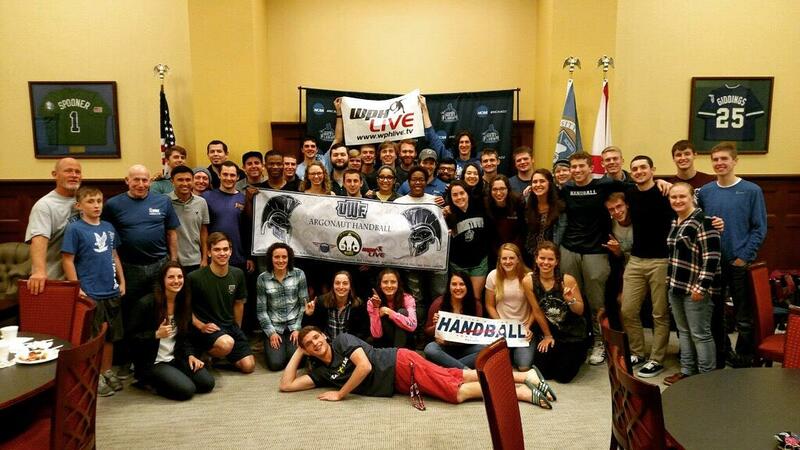 The UWF Handball Team’s practices will kickoff this fall with a number of the incoming freshman joining, with the UWF Handball Team holding three practices during the week and an optional Sunday practice for UWF team members. Stay in School Handball Tournament in Brooklyn (September): JR WPH was proud to be one of the sponsors of the Labor Day Weekend Castle Hill Handball Association’s 2nd Annual Stay in School Handball Tournament, featuring 110 junior handball players at Castle Hill Ave. Handball Courts in Brooklyn, NY. Each participant of the Stay in School Handball Tournament received a free backpack with school supplies fill with school year essentials. In addition to receiving backpacks and school supplies for participating, the top three finishers in each age group won laptops, bicycles, tablets, and more. Wow! JR WPH Battle of the Border V (September): JR WPH was thrilled to present the fifth edition of the Battle of the Border, pitting Team Fred Lewis Foundation vs. Team JR WPH Juarez in one of the most competitive and friendliest junior sports rivalries in international junior sports. Team FLF was seeking to regain the Battle of the Border Cup after losing the last two Cup encounters, while Team JR WPH Juarez was aiming to take the Cup across the border for the third consecutive time. Team FLF and Team JR WPH Juarez split the eight exciting singles Cup matches, with a one game doubles tiebreaker needed to determine the BOTB V champion. Team FLF’s Kena Byrd-Jackson and Sophie Dellacroce were too strong for Team JR WPH Juarez’s Andres Cordoba and Angel Luna in the tiebreaker, meaning the Cup would stay in Tucson. Thank you to Team FLF Executive Director and Head Coach Abraham Montijo and Team JR WPH Juarez Coach Richie “Drft” Fernandez for coaching these two incredible junior handball teams. The incredible sportsmanship and great play from the youngsters is a credit to their coaches, and the sport is incredibly fortunate to have Coach Abe and Coach Drft. If you see these two incredible handball promoters and coaches, say thank you! 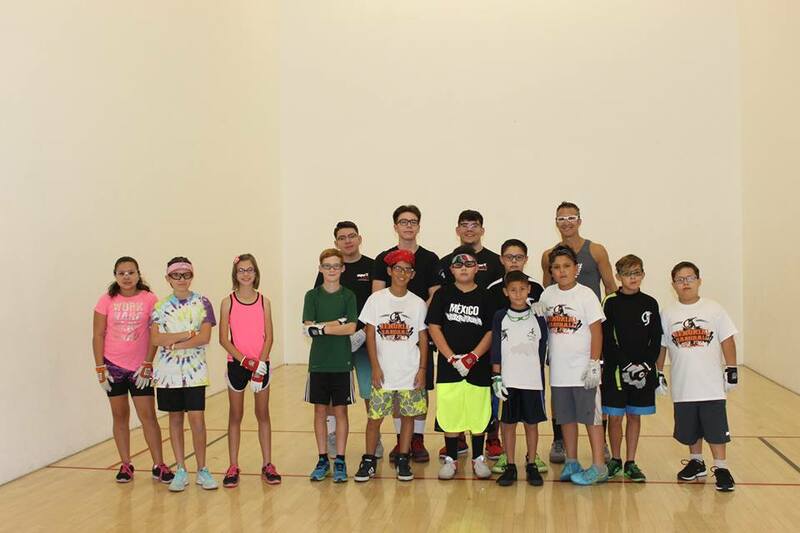 JR WPH Clinic and JR WPH Singles at the ’17 3WB (July): JR WPH was proud to present an exciting junior handball clinic for 12 youngsters competing in the 2017 3WallBall Outdoor Championships. 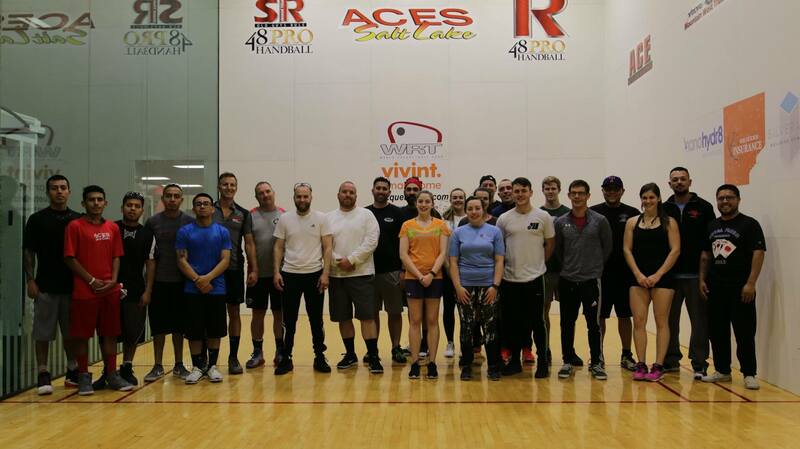 WPH Coaches and 2017 3WallBall World Champions Shorty Ruiz and Martina McMahon played doubles points with the 12 youngsters, alternating partners after each rally. Following the doubles points with the pros, Coaches Ruiz and McMahon discussed the importance of practice and dedication to improve. “I spend 20 hours a week training and playing handball,” explained Coach McMahon. “You need to pay 5-6 games per day and work on different shots while you are playing, then practice by yourself for two hours,” added Coach Ruiz. 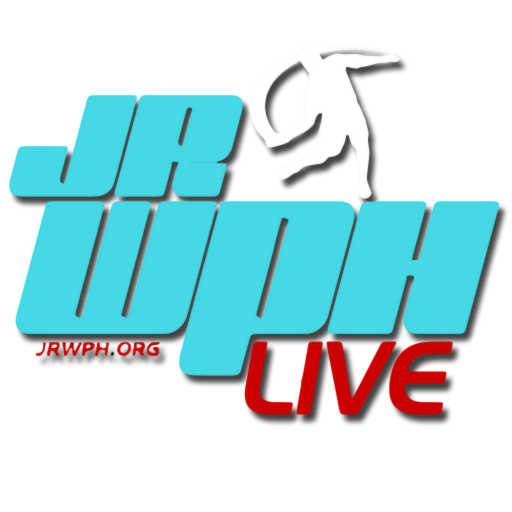 2017 JR WPH Season-Ending Rankings (September): JR WPH held four junior ranking events in 2017, with more than 200 junior handball players between the ages of 8-19 competing in the four JR WPH stops in California (IceMan, Fullerton), Brooklyn (NYC JR WPH Shootout), and Las Vegas (3WallBall). Each JR WPH stop featured a JR WPH clinic alongside the JR WPH competitions, with the junior players having a chance to learn from and play alongside top WPH Outdoor pros and coaches. The 19-and-under JR WPH singles featured four different boy’s winners in four events, as New York’s Tristian Durbin, and California’s Marco Alatorre, Jesus Mendez, and Daniel Barrientos all collected titles. One-half of Brooklyn’s “Wonder Twins” Melanie Garante won the girls 19-and-under singles at the 2017 NYC JR WPH Shootout. 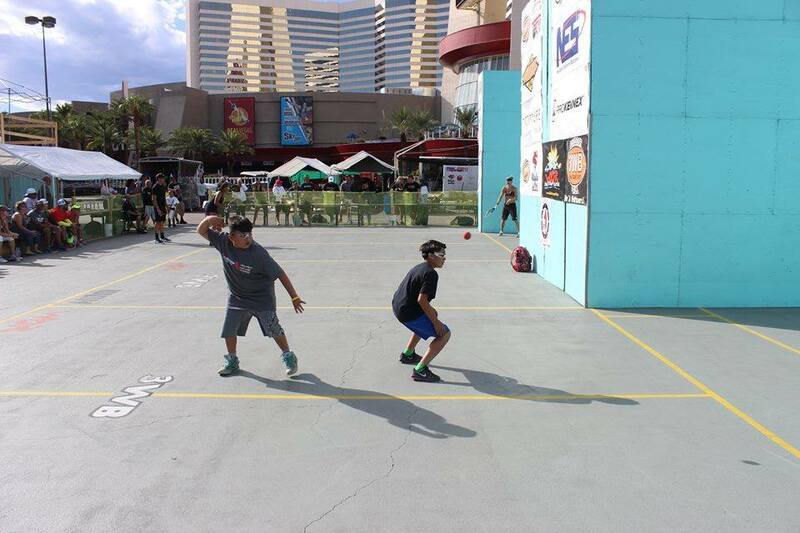 New York’s Edwin Troncoso won the 17-and-under singles at Brooklyn’s 2017 NYC JR WPH Shootout, while California’s Mauricio Molina won the 17-and-under 3WallBall JR WPH singles at the 3WallBall Championships. New York City’s Jasmine Chen captured the Girl’s 2017 NYC JR WPH Shootout in Brooklyn. Central California’s Michael Bautista finished the season as the #1 ranked 15-and-under JR WPH star, finishing second at Fullerton and the 3WallBall Championships. Bautista edged David Sanchez III, Eddie Rocha, Jesus Mendez, and Kelvin Garcia for the top spot. David Sanchez III won the 13-and-under 4-Wall national title in December of 2016 and added the 14-and-under Fullerton title to his glittering resume. New York’s Fernando Hernandez and California’s Abraham Espindola shared the top 14-and-under honors with Sanchez, winning the NYC JR WPH Shootout and the 3WallBall, respectively. Abraham Espindola added the #1 JR WPH 12-and-under ranking to his stellar season, winning Fullerton in June. Southern California’s Xavier Flores and Northern California’s Daniel Sanchez shared the top spot in the 10-and-under JR WPH season, with Sanchez winning the IceMan and Flores winning in Fullerton. JR WPH Singles at Tucson’s Battle I (September): More than 20 youngsters from Phoenix, Arizona State University, Pima College, and the Fred Lewis Foundation competed in the WPH Outdoor Battle I at Tucson’s Pima West College, producing a number of exciting 3-Wall matches and inspiring sportsmanship and camaraderie amongst the youngsters. Fred Lewis Foundation superstar Ayden Brule continued to shine, adding the JR WPH 14-and-under Battle I title to his resume, overcoming Jensen Payton, Miguel Sandoval, and Andres Sandoval to win the title. FLF standout juniors Kena Byrd and Sophie Della Cruce competed in the women’s singles, performing admirably against current 3-Wall national pro finalist Ashley Moler in the round robin format. Kena took second, while Sophie captured third. R48 #1 Carroll Hits UWF For Collegiate Clinics (October): By JR WPH UWF Coach Michael Morgan: The weekend with Coach Killian was a huge success, with the UWF handball team and JR WPH sponsoring R48 #1 Killian Carroll to travel to Pensacola, FL to conduct clinics for 30 collegiate handball players from the University of West Florida and the University of Texas. All of the players had a great time playing handball, catching up with old friends, meeting new ones, and learning from Killian. All weekend Killian showed why on and off the court he is an incredible champion and ambassador for the sport of handball. I’m confident in saying through his tireless efforts with the players this weekend if he didn’t already have them, he now has 30 new fans that will be cheering him on at tournaments for years to come, check that, 31. 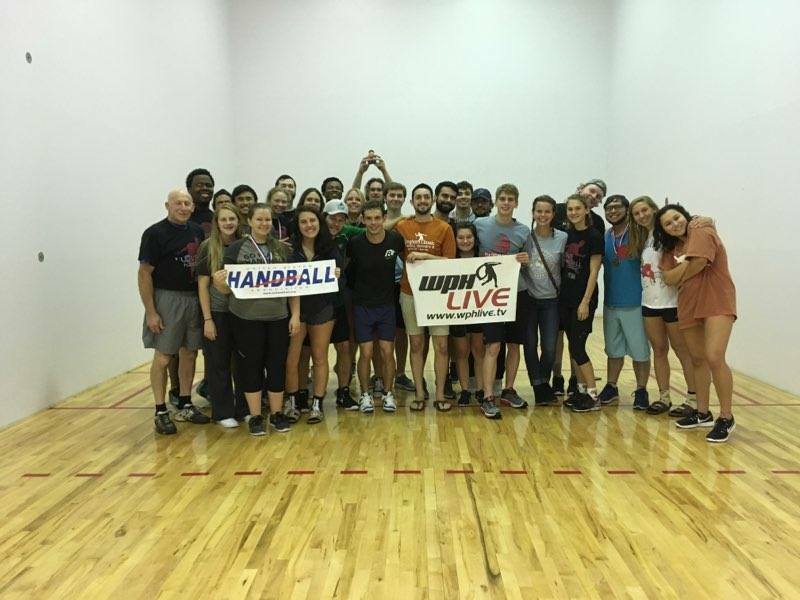 Thank you, Killian and a big thank you to the WPH for the continued support in helping the UWF Handball team grow. 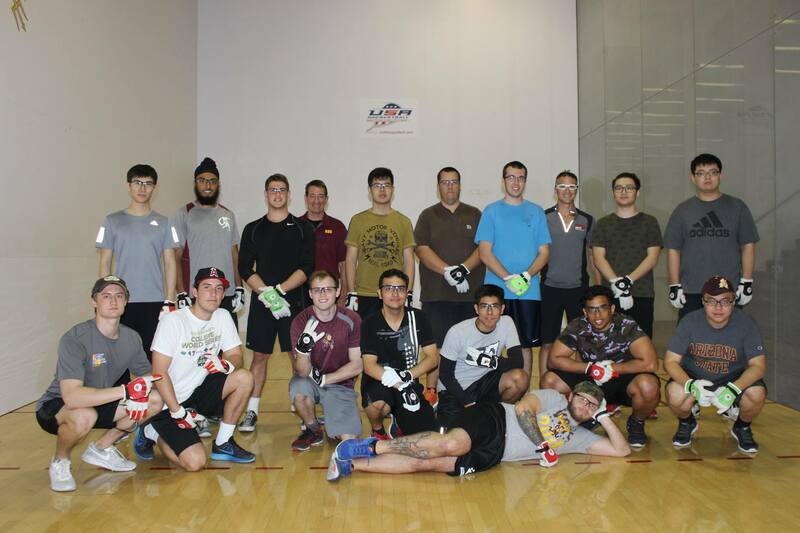 Editor’s note: Thank you to JR WPH collegiate Coach of the Year Michael Morgan and Race 4 Eight #1 Killian Carroll for an outstanding weekend of clinics for nearly three-dozen collegiate handball players. The WPH is extremely fortunate to have Coach Morgan and Killian as ambassadors to the sport and willing to give back so much of their time and energy to this great game. JR WPH Clinic and Singles at the ’17 Memorial (November): JR WPH proudly hosted a clinic, skills competition, and JR WPH singles for two-dozen youngsters between the ages of 8-19 from Arizona, New Mexico, California, and Mexico. 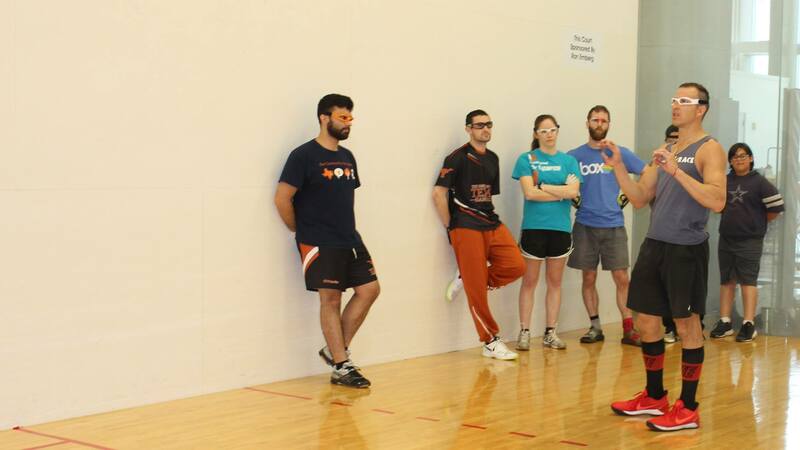 The junior players learned the fundamentals from R48 pros and aimed for targets on kill shots and serves to improve their accuracy and technique. During the skills competition, several of the junior players were interviewed by ESPN’s Kara Mack and discussed what they love about handball. Following the clinic, the juniors played in age bracket JR WPH singles, with each of the participants demonstrating exceptional sportsmanship and skills. Thank you to ASU’s Dan Willeford, JR WPH Juarez’s Drft Fernandez, the Fred Lewis Foundation’s Abraham Montijo for organizing for their junior players to play and running the ’17 Memorial singles. Thank you to all of the junior players for the sportsmanship and passion for the game. 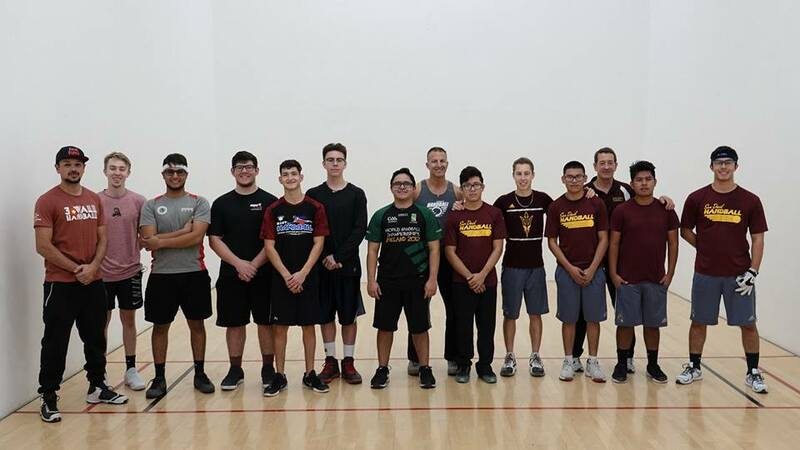 JR WPH Tucson Collegiate Singles (December): A dozen collegiate stars from Pima College and Arizona State University battled for the first JR WPH Collegiate Championship. Fred Lewis Foundation star Carlos Espinoza entered the event as the top seed and cruised to the semifinal with an impressive win against Arizona State’s Esteban Morales. 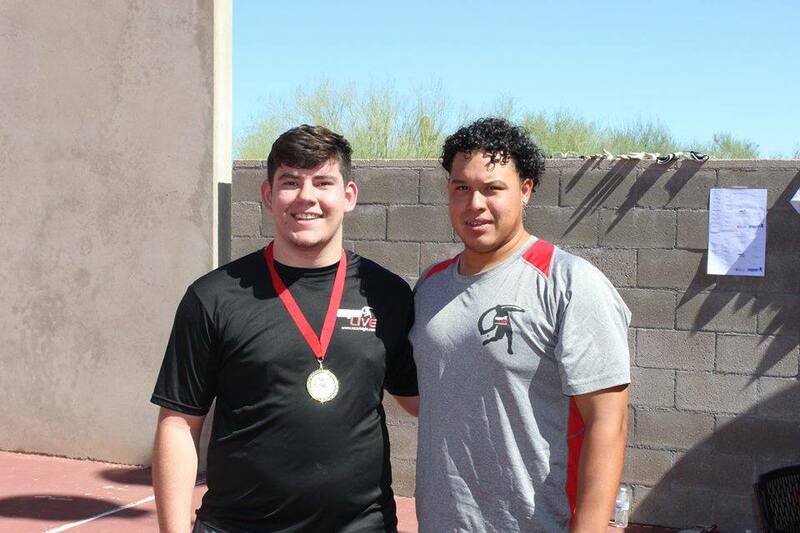 FLF star Noe Rios and FLF alum and current Arizona State star Esteban Camacho played the closest match in the quarterfinals, with the longtime friends and rivals needing overtime to decide a winner. Rios rallied from a 24-25 deficit to score the last three points and advance to the face Espinoza. Thank you to all of our JR WPH donors, supporters, coaches, and players for enabling the World Players of Handball to provide opportunities for thousands of young people to learn and play handball in 2017. JR WPH looks forward to a great 2018, complete with exciting initiatives to grow the sport and inspire the next generation of handball players.